The Canal du Midi is a 17th century engineering feat: Louis XIV asked the architect Pierre-Paul Riquet to build a canal which would link the Atlantic to the Mediterranean, using the river Garonne as far as Toulouse, and then a new waterway from Toulouse to the coast at Béziers. Near where the canal passes over the watershed between Ocean and Med – a strategic position for commercial and military reasons – successive kings and rulers have built forts and outposts manned with soldiers. This property is an old fortress dating back to mediaeval times which was renovated and transformed to resemble a Renaissance château in the Palladian style in 1710. 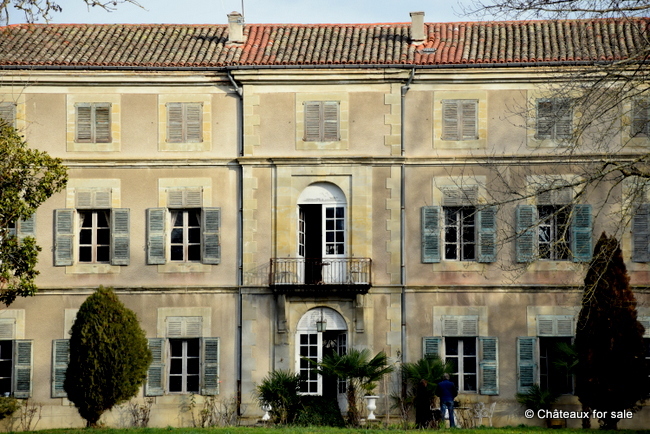 Set back from the Canal, the château affords views over the canal itself and the hills of Lauragais beyond. The estate surrounds the château buildings and includes woodland, paddocks, outhouses and other accommodation. There are around 5.80 hectares in all. The château has been extensively refurbished over the past few years: the roof has been re-laid and strengthened, oil-fired central-heating has been installed with appropriate, period cast-iron radiators, panelled ceilings and original terracotta flooring have been stripped and restored. There is currently enough space renovated to create an authentic guest house which will transport clients back to the hey-day of this … palazzo. At least four big and comfortable bedrooms with en-suite bathrooms are now in place. The spacious kitchen, superb dining and living rooms as well as the main hall and billiard room are decorated and furnished to welcome either guests or owners tomorrow. The servants’ quarters are a maze of rooms in surprisingly good condition (the whole building is dry and free of damp or infiltration) which could quickly be converted into comfortable living quarters. The third floor – the attic – is a vast space covering over 400m² – with windows – and could accommodate another 6 bedrooms with en-suite bathrooms. Independent dwellings occupy most of the west wing – 3-bedroomed duplexes currently on short-term lets. The east wing – with its lovely little Italianate courtyard – is home to more rooms, studies and laundry rooms as well as an artist’s studio. A cottage on the estate close to the canal is also let out. Our opinion: There are not many châteaux on the Canal-du-Midi. With tourists piling into the area at Carcassonne and Toulouse airports we feel that this property has a future as a bijou guest house – using 3 or 4 guest rooms and pampering customers with regal banquets of local specialities (Cassoulet hails from the region), cycle rides on the Canal, horse-riding along the Lauragais trail and boat trips. Alternatively one could let the whole château in the summer months to family groups for around €5k per week. The two houses in the west wing and the cottage could be transformed into holiday houses and let out weekly over the season.